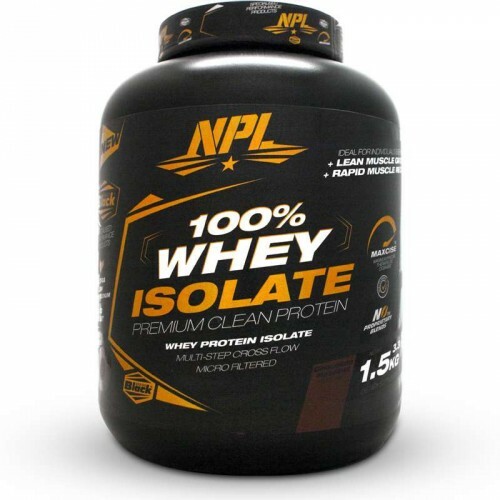 NPL Whey Isolate is a pure protein shake for rapid muscle recovery and growth. Protein is the undisputed King of muscle building. Fitness athletes and lifters consume 20 – 30 grams of protein per whole-food meal and supplement with 1 – 2 protein shakes to meet their daily protein requirement. Each serving of this shake gives you 20 grams of protein from whey isolate. Whey Isolate is one of the purest forms of protein currently on the market. It is a highly bioavailable and fast digesting protein source which means your muscles start receiving protein within minutes after drinking the shake. This makes it perfect as a post-workout drink to improve muscle recovery and start the building process. The isolate used in this product has been made using a cross-flow micro filtration, multi-step purification process that preserves important muscle-building protein fractions. This process removes excess carbohydrates and fats leaving a clean and pure protein shake. Drinking this shake is an absolute pleasure. Available in delicious Chocolate Hazelnut and Vanilla Cream. Being a purer protein each 1.5kg tub will give you 60 servings. A full month supply if taken twice a day. NPL Whey Isolate is one of the purest whey shakes on the market, giving athletes preparing for a show a low carb and fat protein source for solid lean gains. • Mix two heaped scoops with 150 ml of cold water. • Drink a serving first thing in the morning and one directly after your workout. • Serving size and number of daily servings can be adjusted to meet individual protein requirements. The best quality whey isolate on the market!! If you are looking for the purest form of protein, try this! Mixes very easy with cold water, chocolate and hazelnut flavour is great.